Level 10 has done it again. 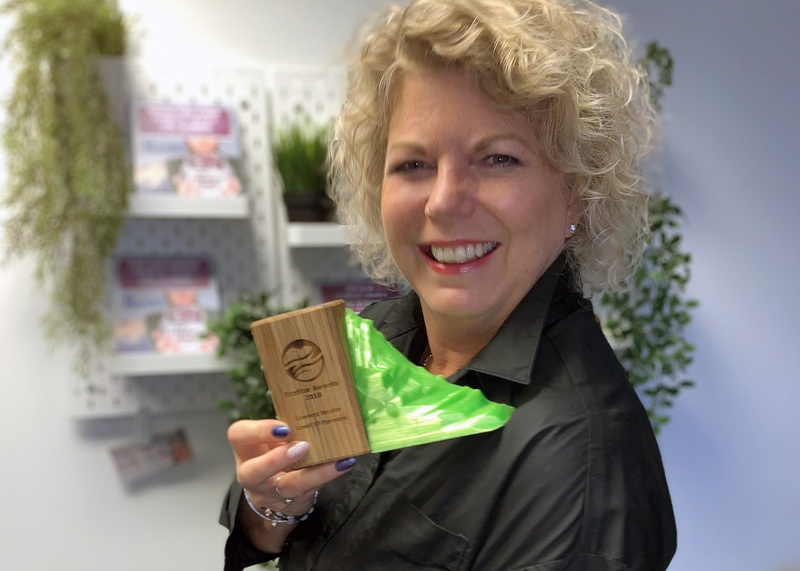 The Courtenay salon and spa came away with “Greenest Retailer” honours from the 2018 Vancouver Island EcoStar Awards gala held recently in Victoria. The annual awards celebrate excellence in environmental achievement and leadership by organizations, businesses and individuals. Originally introduced by the Capital Regional District in the early 2000s, it’s now open to the whole Island and has been hosted by the Synergy Sustainability Institute for the last four years ago. But, in fact, Level 10 Eurospa has gotten noticed in recent years, both for its business and environmental achievements. Winner of several Comox Valley Chamber of Commerce honours, including its inaugural Sustainability Award in 2016, the full-service salon has made a point of providing top-notch customer care while reducing its environmental footprint. 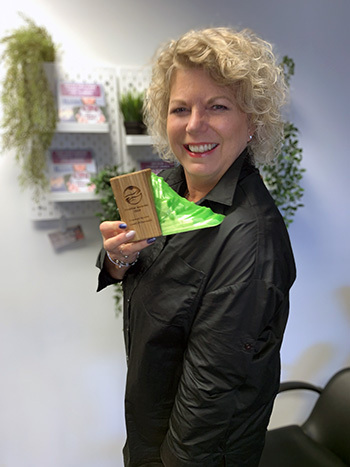 Owner Leanne Boyd shows off Level 10 Eurospa’s new EcoStar Award, which honours the Courtenay salon for being Vancouver Island’s Greenest Retailer. Those efforts have resulted in the diversion of more than six tonnes of waste from landfills and waterways in the last five years alone. In 2017, the salon also switched to a tankless water system and new showerheads on all sinks, cutting its water and heating bills by almost half and dramatically reducing carbon emissions. Additionally, Boyd became a certified Green Ambassador in March 2017, and later co-hosted an event that invited other Comox Valley salons to bring a week’s worth of their waste to be recycled and repurposed, and learn how they, too, can help reduce the industry’s environmental footprint. For a list of all the 2018 EcoStar winners, visit http://ecostarawards.com. To learn more about Level 10 Eurospa, visit www.level10eurospa.com. Union Street Grill is giving away 2015 MusicFest passes for a song! next post: RP Copywriting has a new boss!